There are better options for getting natural results, but EFX 3 is a bargain for creative auto-tuning in electronic genres. The classic T-Pain/Cher effect. Improved natural tuning. Patterns great for creative use. Suitable for live performance. Good price. Not the most transparent tuning on the market. In 1997, Antares unleashed Auto-Tune on an unsuspecting world, dropping a bomb the reverberations of which can still be heard today. Cher's Believe made it famous (there was genuine debate as to how the effect had been achieved, until everyone pulled the retune speed down to zero on its Auto-Tune and the secret was out), after which Auto-Tune became the dominant cliché in music production for about a decade. Six or seven years ago, however, thanks to T-Pain (who's name became synonymous with the effect), Auto-Tune found a new credibility and could once again be heard everywhere, from trap to hip-hop and pop. Indeed, it still can, although thankfully it seems to have settled into a less overt role of late. 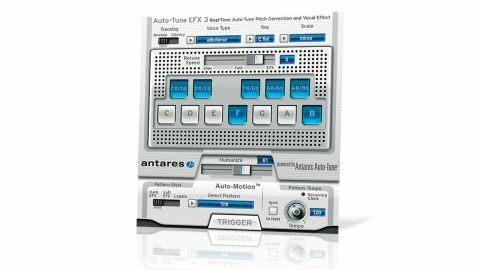 At $399, the full version of Auto-Tune is a pricey affair, which is why Antares also offers a cut-down edition in the shape of Auto-Tune EFX (VST/AU/AAX). This features a simplified auto- correcting system with none of the manual fine-tuning and tweakability of individual notes and transitions found in the full version. "EFX's new features make it by far the most creative budget tuner on the market"
You can just let it automatically fix any overly flat or sharp notes to their nearest absolute pitch, of course, but for even more precise correction (of even less precise vocals), you can tell it the key of the song and have it nudge everything to the nearest notes in the chosen scale. Auto-Tune EFX 2 introduced Auto-Motion, which enabled prescribed musical tuning patterns to be triggered (there's a substantial list of presets, and you can program your own using a musicXML editor), based on the pitch of the audio it's receiving when the trigger is engaged. These produce fairly impressive (if unnatural) flourishes and patterns of the type you've undoubtedly heard in action on a variety of hits and club classics over the last few years. One thing Auto-Tune EFX has never been great at, though, is creating natural-sounding vocals - and its this shortcoming that version 3 seeks to address first and foremost. There are just two new features in EFX 3, both of which have been brought in from the full Auto-Tune 7. The first is Retune Speed, which allows you to set, in milliseconds, the speed of the pitch correction. Set it to zero and you get that iconic unnatural note-hopping; the higher you raise it beyond that, the more natural the slides from pitch to pitch sound. The second new control, Humanize, offers a similarly profound improvement on EFX 2's less configurable setup. Essentially, it treats short and long notes differently, correcting short ones but leaving long ones unaffected to an extent determined by the Humanize slider, so that your singer's natural vibrato and note transitions are maintained for longer notes. You can even automate the control to fix individual dodgy notes but leave the better ones alone. It's hard to overstate quite how important EFX 3's two new features are - they allow it to produce the more natural pitch correction that users of the full Auto-Tune have enjoyed for years, and they make it by far the most creative budget tuner on the market. It's still not 100% transparent by any means, but it's a massive improvement - enough to keep its users happy, we suspect.